Today I’ve rounded up 10 of my all time Favorite Roses Images! I’ve searched through our Vintage Image Archives here at The Graphics Fairy to find my top 10 Rose Flower Downloads. This is a great collection of some of my best offerings in this theme, in a variety of colors, there are big beautiful Red Cabbage Roses, Pink Tea and White Tea Roses and more. These would work beautifully in all sorts of Graphics Design, DIY or Craft projects, like Handmade Cards, Invitations, Decoupage, Scrapbooking, Pillows, Gift Tags, Wall Decor and More! 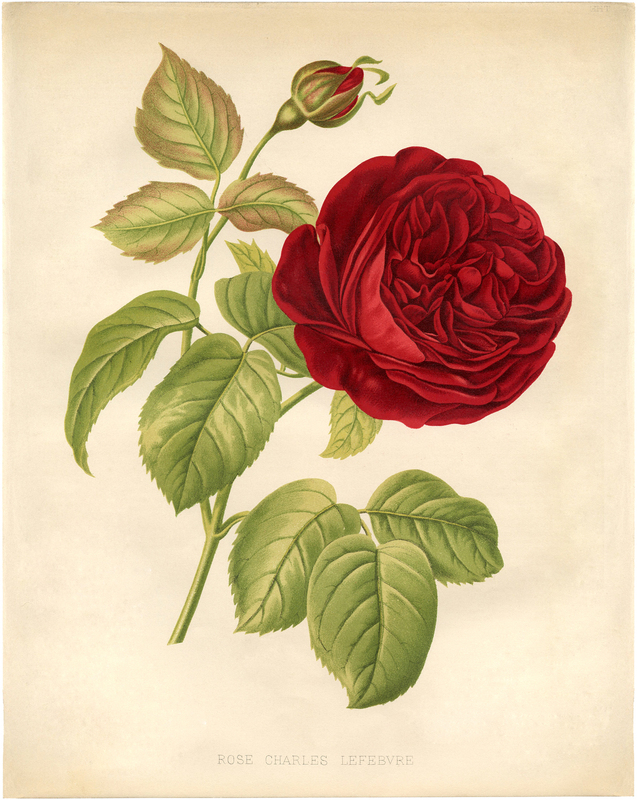 Our first Download is this lovely Red Rose with Hand Image. 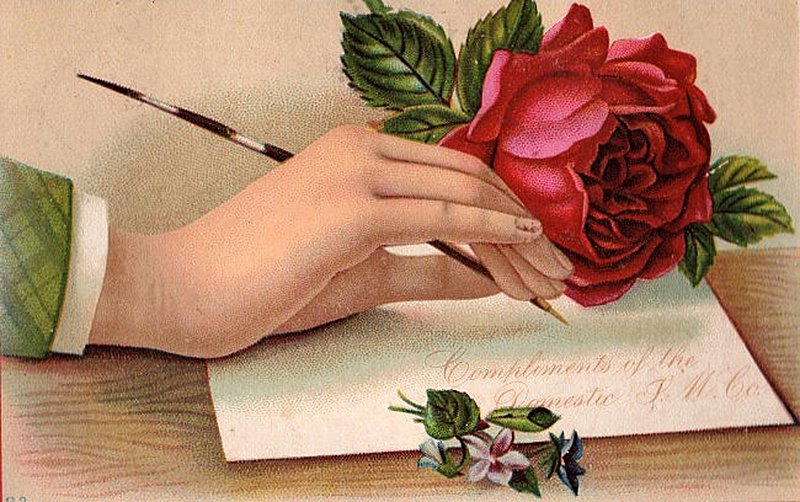 This is a classic Victorian Image showing a Ladies Hand holding a Pen. She is addressing an Envelope and the Red Cabbage Rose in the background is a lovely compliment to the scene! Next on the list is this Super pretty Pink Hybrid Tea Rose Botanical Print! I just love the soft pink shading on this Antique Floral Print. I was able to obtain a coordinating set of 3 of these, I have included all of them in this post, so make sure you use the slider to scroll through and grab them all. They would be lovely Framed and Hung together on a Wall! 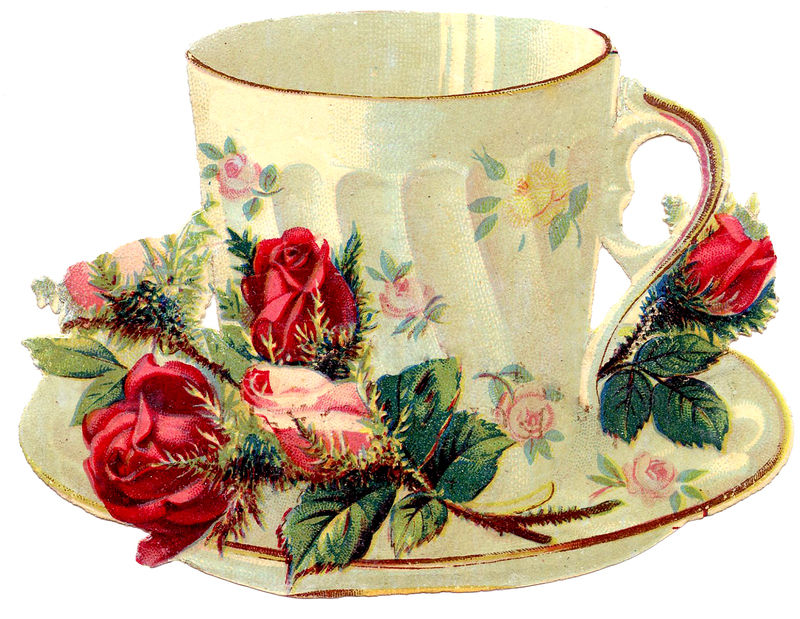 Next we have this wonderful, and hard to find, Vintage Teacup with Roses Graphic! This one is an old Victorian Scrap Advertising piece showing a pretty little Chintz cup with some Red Moss Roses along the saucer. Such a charming piece! This one would work very well in Collage or Mixed Media pieces. This image comes from that print, it’s Circa 1850’s and was made in Paris! 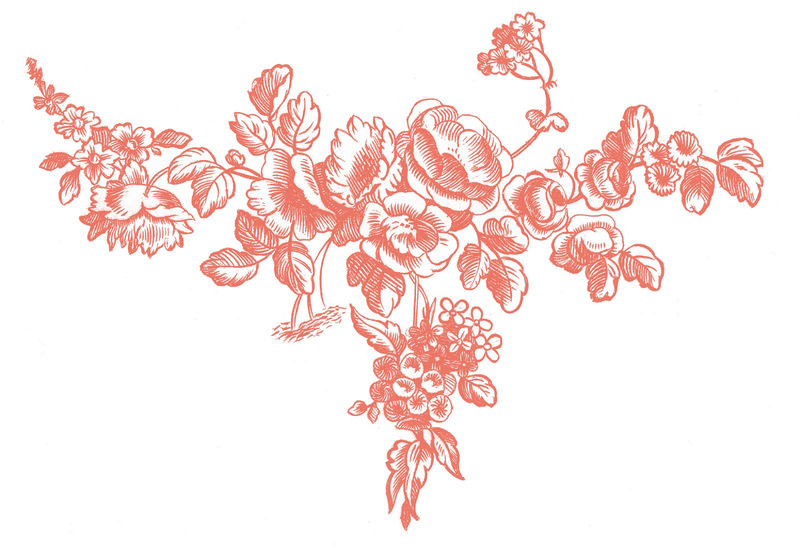 I love these Old French Floral Engravings so much. I think these Roses are especially pretty. You can do so much with these, nice for Stationery or Invitations, Web Design or lovely for Decoupage and Transfers too! This is a Beautiful Vintage French Roses Image!! Featured here is a lovely Antique Trade Card from Lyon. 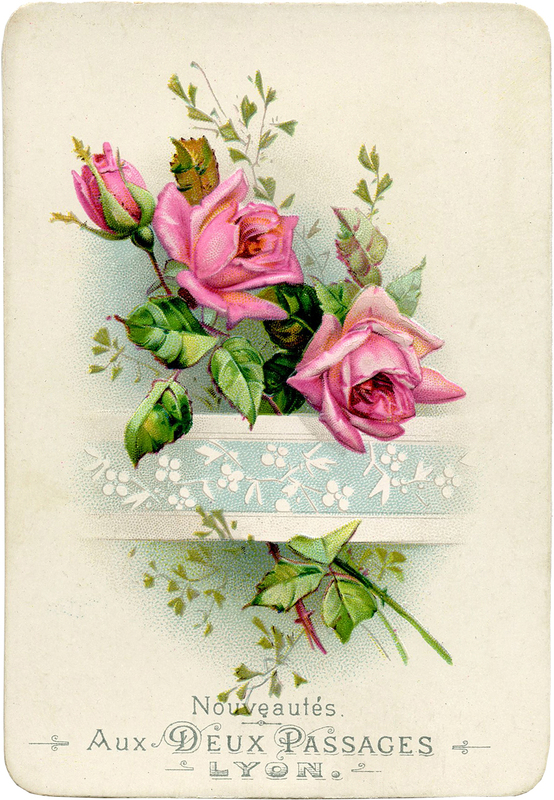 The card shows some pretty Pink Roses, tucked into an embossed Paper Strip. So charming! Another nice one for your Mixed Media or Collage projects! This vintage White Roses Printable is the second one in the series of 3 on this post. 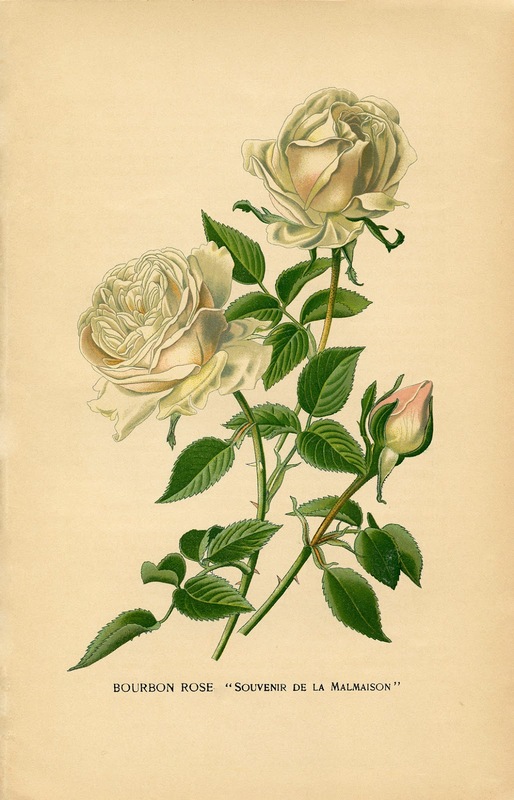 Shown above are some beautiful White Roses, tinged with Pink, from a Circa 1890’s Garden Antique Book! According to the title on the Print this one is a Bourbon Rose. This is a gorgeous Vintage Botanical Printable, just begging to be printed out, framed and hung on a wall! So I cheated a bit on this one, since it’s actually a mixed bouquet, but I had to squeeze in this Floral Rose Bouquet Image, since it’s one of my favorites! 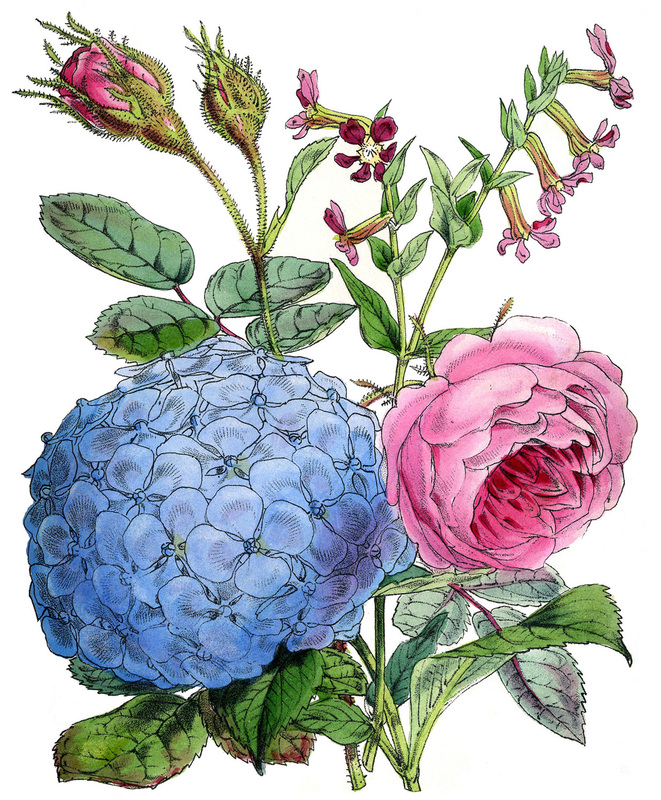 Scanned from an 1850’s English Botanical Book, in my collection, this one shows a stunning combination of Pink Roses and a Blue Hydrangea! Such a yummy combo. 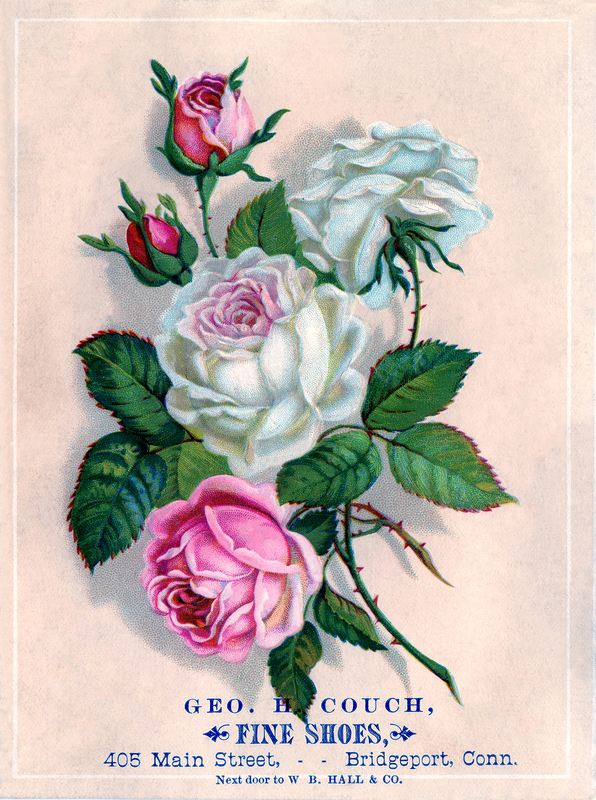 This Free Roses Stock Image, is a gorgeous old Advertising Trade Card for a Shoe Store in Connecticut! Featured on the card are some stunning White and Pink Cabbage Roses!! This would be wonderful to use in a Collage, for Cardmaking, decoupage or even transferred onto a Pillow for a fabulous Home Decor accessory! Swoon! This Red Rose Botanical Printable is the best one that I have ever found!! Isn’t it gorgeous?!! 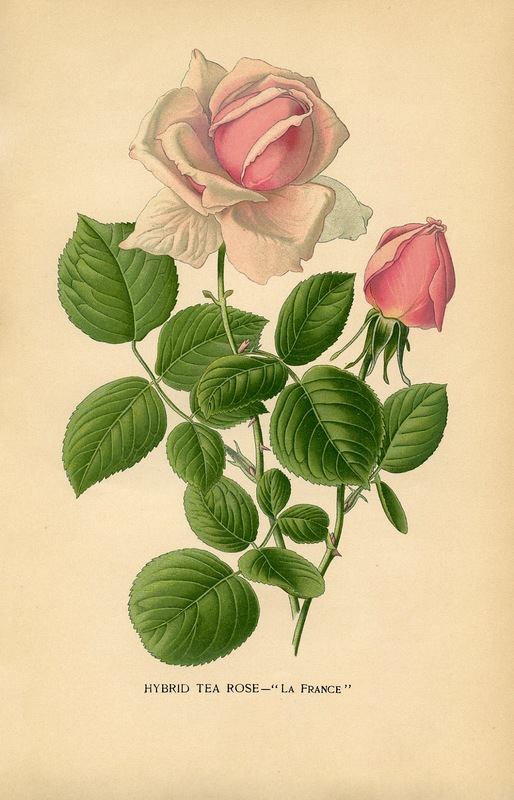 This print dates to Circa 1883 and according to the caption the Rose in the Picture is a Rose Charles Lefebvre. Such a spectacular looking flower and a true Cabbage Rose! You can print this up and frame it for some Instant Botanical Art, or use it on a DIY project, I think it would it would be lovely transferred onto a pillow! This one is number 3 in the series of 3 on this post. 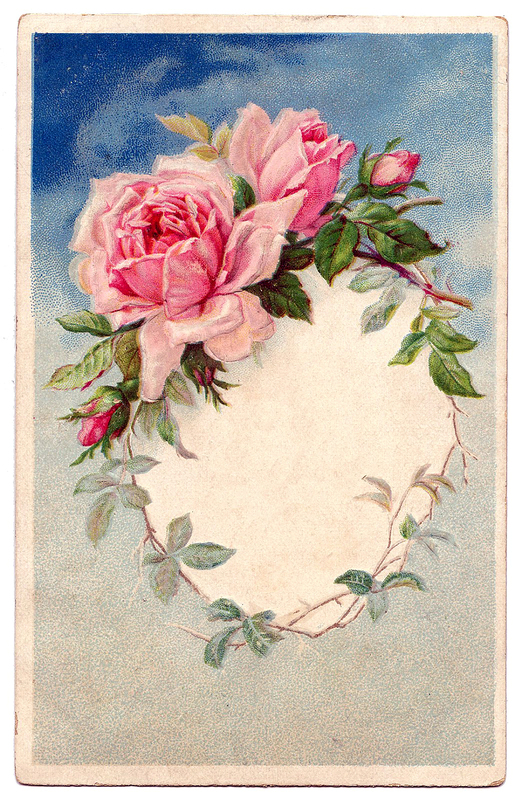 And last but not least is this old Postcard showing a gorgeous Pink Roses Wreath Frame! You could add some text in that little blank area to customize it, or use it to frame up a photo! I hope you will find lots of inspiration when you browse through these Vintage Rose Images, and that you come up with some creative ways to use them in your own Craft and DIY Projects! 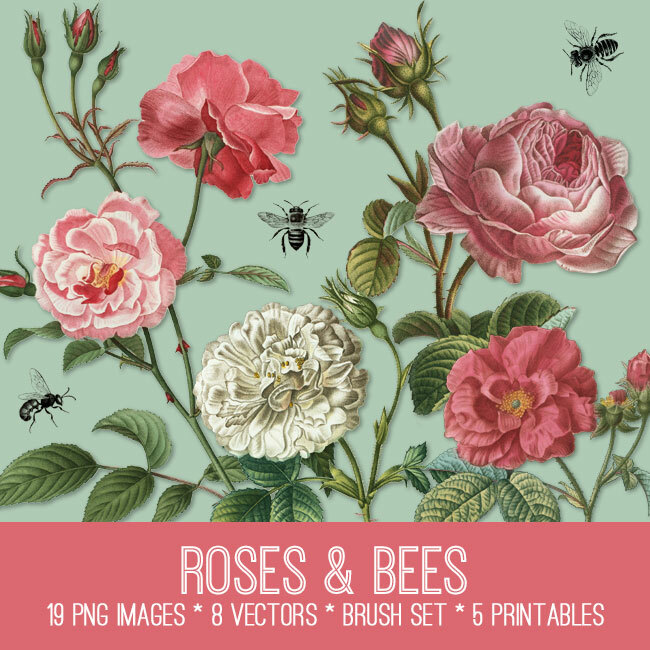 You might also like our Popular Roses and Bees Kit available as part of our Premium Membership Site HERE. For one low monthly (or one super low annual) fee you get a plethora of fabulous Premium Images and Photoshop Tutorials! New kits are added each week! Hello! Are you new to The Graphics Fairy? Welcome, I’m so glad you’re here! Browse around to find thousands of Stock Images that you can use in your projects or designs! I post new Vintage images every day, as well as projects and DIY’s too! « Vintage Peonies Girl Image! You are so welcome Carolyn! Oh yea Carolyn, that’s great! What Carolyn said. Love your site and your emails. Keep ’em coming!!! What a beautiful collection. Just love the Red Cabbage Rose especially. Roses are my favourite flowers! Thank you so much for these gorgeous graphics!! Yea! So glad you like them Sarah! Love your website. Love your rose graphics. Thanks so much for all the gorgeous roses images, so pretty. Hi Karen, how to download the images that have no “click here to download full size printable PDF” notes? Thanks! The images are beautiful! Thank you so much Karen. These are so amazingly beautiful and some so delicate. Proud to be a member. All the images are great but I particularly love ALL the roses! They are so gorgeous – thanks for all you do!! What a gorgeous collection of roses! Wow! The details and subtle tones are outstanding! Oh my — my mind is running wild! Thank you so much for sharing these beautiful images with us! Thanks Irene, I love these too! !